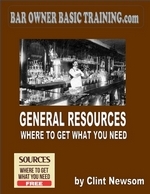 An employee manual, also known as an employee handbook, is the product of a decision to own a professionally and ethically operated bar. It is the best tool you have to communicate to your employees what is expected of them and what they can expect from you. When all parties understand what they can expect, it becomes possible to create an atmosphere in which your employees can succeed, and you can succeed. There are many benefits to implementing an employee manual. An employee manual can be a first line of defense in protecting yourself against lawsuits. However, it cannot inoculate you from lawsuits. Lawsuits can come in many forms and from many different directions. In addition to civil lawsuits, lawsuits can come from a multitude of government agencies. You can be sued for discrimination, sexual harassment, for employee misconduct as well as your own. The fact that you have taken the time to properly prepare an employee manual, established legal and ethical procedures for all employees to follow that are equally enforced, and keeping this manual continually updated to reflect current regulation, will demonstrate your desire to abide by all laws. An employee manual can be very simple or more in depth. It’s your choice. It can depend on the size of your business and how many employees you have. It is a great opportunity to state your basic policies and your philosophy for creating a successful bar. It’s difficult to cover every situation that might arise, but when your employees are grounded in the basics, they will have a good idea on how you might want them to react. An employee manual can be an invaluable management tool. It will only work, however, if you keep it up to date and evenly enforce the rules contained therein. This manual can help you establish the image you want to project to the public. When the public encounters well-trained, well-informed, and well-behaved employees, it makes the statement that there is an owner who cares. People want to patronize a bar like that. Click Below for the version that works best for you.